As vice president of human resources, Connor is responsible for all human resources policies, programs, and services for the organization. Areas of responsibility include employment, compensation, employee relations, health and welfare, safety, organization development and learning, and compliance with all applicable federal, state, and local laws. 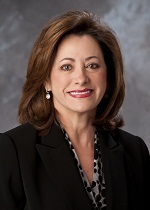 Since her leadership appointment at NFIB in 2002, she has been instrumental in integrating human resources initiatives into the strategic goals of the organization. Connor has over 25 years of experience in administration, management, and human resources. She holds a degree in business administration and a senior professional human resources designation. She is an active member of the national and local chapters of the Society of Human Resource Management and currently serves on several senior HR roundtables in Middle Tennessee and Washington, D.C.